Here is the cover. It's just vellum folded over and sewn around the edges. If you aren't familiar with a waterfall book. Actually, I don't know if that is really the right term but hey, I'm goin' with it. Basically, it is a book that each page is a different size starting with the smallest and then leading up to the largest. Make sense? I spelled out the word luck on each page and then did the whole thing where you use the letter to explain why you are luck on that page. This one shows my girls. My three Little Ladies. Lucky indeed! At the time I made this for "C" I wrote I was lucky because my girls are clever, creative and they cooperate. Ya, that was years ago. Now a days I have a teen and two tweens. Things are different. They are still very clever and super creative though. Cooperative, ummm, not so much. Anyway, you get the point. I love this little book. It's pretty old now but it still holds a place in my heart as one of the favorite things I've made. I feel lucky to have it. Step 2: Turn paper over and using a ruler and a pen, mark at every inch all the way down the long length of the paper. You'll have 11 marks when you are done. Step 3: Score and then carefully fold on the pen marks you made. 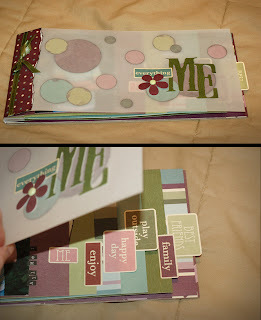 Step 4: Accordion fold your paper so it looks like the photo shown above when you are done. Step 5: Starting at the back of your book, place a 6 x 12 piece of paper on the end of the accordion fold paper. Step 7: After all your pages are added you will have something that looks like the photo shown above on the left. Just a tip: When adding your pages, make sure they line up on the top and the bottom with the pages below them. Step 8: Add adhesive inside each fold on the back side of your binding. This will close it up and allow it to lay flat and open like a book. Step 10: Using a scrap of paper that measures at least 6 x 3 inches, cover the edge of your binding to complete your book. Step 11: Decorate as you wish! So, here's a few other books that I've made using this same process, the Lucky book is my favorite but these are kind of fun too. That is very cool! I'm going on a scrapbooking retreat next week and am going to make one of these. Thanks!